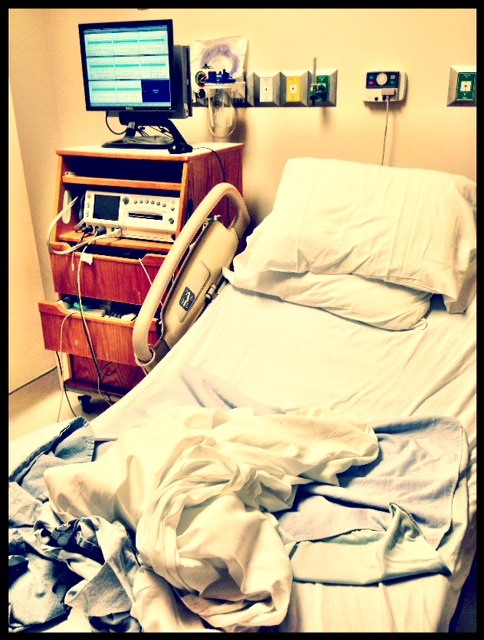 akupofkatie: Did I hear you say, labor and delivery? Did I hear you say, labor and delivery? No need to panic guys, I'm okay and baby girl is STILL cookin' away. We did have a little scare in our home today, however. I felt a little funny yesterday and the last few days. You know how I've been writing about slowing down? That's because I felt like I needed to. I told the MVP yesterday that I felt like I was beginning to feel the Braxton Hicks contractions. FYI, Braxton Hicks are normal, and I knew that. I knew they didn't hurt and they were basically your body practicing contractions for labor. I'm 28 weeks pregnant, which is a common time to begin feeling them. I didn't worry much, until this morning. I didn't sleep well and woke up feeling tight. I tummy kept getting really hard. I mean, super hard. It didn't hurt, but it seemed unusual. I started timing the hardness because I knew that 4-6 contractions in one hour is a bit worrisome. Sure enough, they were every ten minutes for about an hour. They would last anywhere from 30 seconds to 2 minutes. They weren't painful yet I felt super uncomfortable...and worried. I tried talking myself out of what was going on! I haven't had any signs of pre-term labor and have yet had to worry about it...so I was a bit stubborn. Then...I began to feel like I had to go...diarrhea. And, I had slight cramps that resembled menstrual cramping. I called my Mom and she casually told me to call the doctor (trying not to cause me to panic). So, I went to work and called right at 9 when the office opened. The lovely nurse asked about my symptoms and nicely but firmly told me I needed to go the hospital to the labor and delivery unit to be monitored. Excuse me, labor and delivery? I thought I would just be seen in the office, not the hospital! So, I began to get a bit teary, panicky, and well, scared! The funny part is that we are scheduled to do our hospital tour this Wednesday and pre-register for the real delivery. Never in my wildest dreams did I expect to be peeing in a cup, slipping on hospital a gown this Monday, at 28 weeks. Obviously I called the MVP, trying not to sound too worried, but, his voice alone sent me into tears. He's my safety zone and around him I don't feel like I need to be strong. I kind of lost it but only for a second. I knew deep down that everything was going to be okay. My wonderful mother-in-law rushed over and met me before the MVP got there. They hooked my big belly up to the monitor and immediately I could hear her heartbeat and her bouncing around. My belly was on a LOUD microphone and each time she moved my eardrums just about burst! She's an active little lady, I'll tell you! I had two contractions in no particular pattern. They checked my cervix, everything was great. After about an hour of monitoring they sent me home telling me to rest and drink a lot of fluids. They said it was GREAT that I listened and came in and if contractions began again, in a pattern, to come in right away. I wanted to write about it because I know so many preggies right now! If you are EVER concerned or feel even kind of off, call your OB. Let them make the call on what you should do. I can't wait to meet our baby girl but I'm ever so thankful it wasn't today. Thanks to my family in San Diego, my in-laws here, and my work staff who were so gracious! I hope NOT to be back there any time soon but it was good practice for the real deal. So preggies, pay attention to your body and don't be stubborn! Who is watching the Bachelorette FINALE tonight?!?!?! Wow! And your babes are so amazing! Scary! So glad everything is fine! Never feel bad about going to the hospital, better safe then sorry and a piece of mind! Good job momma!! Sorry I wasn't there to help this morning. Lots o prayers and love yours and Luke's way!! Thanks lex!!! I'm glad everything is okay too. Yikes it was scary!